DescriptionWilliam John Elwyn Davies was a painter, born in Newcastle Emlyn in the heart of rural west Wales in 1916 the youngest of four children. His father ran a woollen mill, one of many that once flourished on the banks of the Teifi. John Elwyn, like Graham Sutherland in Pembrokeshire and John Piper in Snowdonia found inspiration in a familiar environment, his being the isolated farming communities in his native Cardiganshire. John Elwyn’s work represents the quieter strain of Neo-Romanticism in British landscape painting. Elwyn attended Llandysul County Grammar School until January 1935 when he enrolled at Carmarthen School of Art, transferring to the West of England College of Art at Bristol in September 1937 to complete his final year. He was awarded a Royal Exhibition Scholarship to study at the Royal College of Art, London in 1938, one of only six awarded nationally. A consummate draughtsman, John Elwyn’s facility for figure drawing attracted considerable attention - he was awarded the Diploma Prize and College Prize for Life Drawing. Gilbert Spencer, Professor of Painting, considered John Elwyn to be one of the best students that he had ever been fortunate enough to teach. In September 1948 John Elwyn moved to Hampshire to teach at Portsmouth School of Art. His paintings there concerned themselves with sailors and the sea, but from his lonely bed-sit in Portsmouth the fond nostalgia and yearning for the homeland, that the Welsh call hiraeth began to manifest itself in a remarkable series of paintings which drew upon episodes of his life as a young teenager in Newcastle Emlyn. The chapel paintings were first exhibited at the Paul Alexander Gallery in Notting Hill, opened by Carel Weight in July 1949. By the early 1950s John Elwyn’s work was widely acclaimed and he was exhibiting at the Royal Academy, the New English Art Club, the Royal National Eisteddfod (where he was awarded the Gold Medal for Fine Art in 1956), the Welsh Arts Council, the Contemporary Art Society for Wales, the Society for Education through Art and the National Museum of Wales. He showed regularly at the Leicester Galleries, London annual exhibitions of ‘Artists of Fame and Promise’ between 1950 and 1968. Paintings were frequently purchased by education authorities, private and public collections. 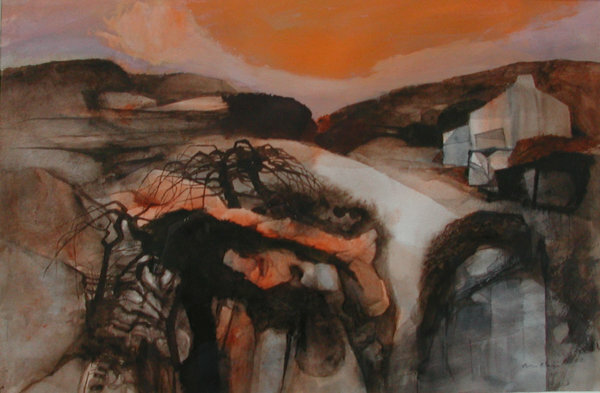 The visual drama of the Welsh industrialised landscape soon replaced the tranquility of the chapel paintings as John Elwyn focused his attention on the miners and their landscape near Pont-Rhyd-y-Fen where he had lived when working on the land during the war. In September 1953 John Elwyn moved to Winchester where he taught at the School of Art (a position he held until his retirement in 1976). That year he made his first lithographs with Edwin la Dell at the Royal College..
At Winchester John Elwyn’s paintings followed a new line of enquiry, this time drawing upon his wide experience of the working life of the countryside. In 1962 he started a series of large abstract compositions, which eventually formed solo exhibitions at the Leicester Galleries in 1965 & 1969, both were a financial and widespread critical success. He was invited to become Honorary Member of the Royal Cambrian Academy in 1970, member of the Royal Institute in 1979 and Honorary Member of the Gorsedd of Bards in 1982. 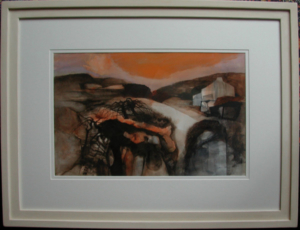 In 1996 the National Library of Wales paid tribute to John Elwyn’s distinguished career with a major retrospective. Later that year he was awarded Honorary DLitt by the University of Wales in recognition of his contribution to art in post-war Wales.